One of two former synagogues in Ernakulam once serving the Malabari Jews can be found in the center of the crowded market area on west side of Market Road just south of where it intersects with Jew (or Jews) Street. Look for a faded sign at the street above the entrance path that identifies the property as both the “Cochin Blossoms” fish and plant store and Kadavumbagam Synagogue. Seek out its owner inside, Mr. Elias “Babu” Josephai, who will gladly show any visitor around the property, including the mostly intact prayer space to the rear. While there, speak with Mr. Josephai regarding a visit to the other former Ernakulam synagogue, the Tekkumbagam, which can be found a five-minute walk away on the north (right) side of Jew Street between Market Road and Broadway. It is located a short distance past a landmark mosque on the same side of the street. HISTORYAlthough its history cannot be verified, narratives claim that the original Kadavumbagam Synagogue was constructed in the medieval period in the port town of Cranganore to the north of Kochi. At that time the Moors, who had arrived on the shores of Kerala some time earlier, had aligned themselves with the native ruler. Since spices were a valuable local commodity and the trade was lucrative and competitive, the Moors saw the Jews, who were involved in the spice trade, as competition that needed to be eliminated. The Moorish persecution convinced some Jews to abandon their synagogues and they resettled in Ernakalum in 1154 (Josephai, interviews by the author, Ernakulam Kerala, 2007/2009). There they were provided relative safety and protection under the tolerant and sympathetic Rajah of Cochin. In 1200, they built the Kadavumbagam Synagogue (Sassoon: 577). Another narrative goes that Jews, faced with persecution once again by the Moors in 1524, fled Cranganore by boat and settled in Ernakalum, finding protection under the Rajah. Yet a third story goes that the Jews of Cranganore and surrounding areas were persecuted the Portuguese during the mid-sixteenth century by the Portuguese – and in three rounds they arrived in Ernakulam (Segal: 19). According to Elias “Babu” Josephai, the current guardian of the synagogue, the building as it stands today dates to the early sixteenth to early seventeenth centuries. It is Josephai’s claim that the two-storied front section seen from the road was added to a slightly wider and higher building approximately a century later. Both sections replaced earlier structures of unknown dates that are believed to have stood on the same site. Today’s synagogue is set back from Market Road, the central spine of Ernakulam’s busy market area, and is approached along a long and narrow passage lined with plants. It was common to Kerala synagogues to have a gatehouse facing the road, but none exists here, and it is unclear whether there was ever any such structure. The sandy path that begins at the street and leads to the synagogue is on axis with the front façade. Similar to other Kerala synagogues, the building is constructed of locally quarried laterite stone block walls veneered in white-washed chunam, or a polished lime plaster. The building’s two corners facing the street are broadly chamfered, so from the front Kadavumghagam Synagogue is half-octagonal in form. The angled wall intersections are demarcated by rusticated quoins that have been for years painted a rust color. 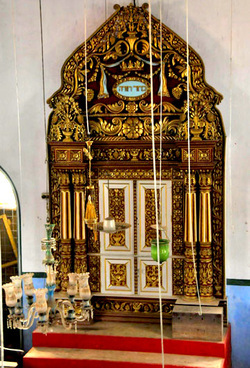 The front section is unusual for a Kerala synagogue. On the ground floor, it was used as a social hall and for overflow seating during Jewish high holidays and special occasions. On the second floor were rooms that once served as a Jewish school when the congregation was active. Since Jews used to live to all sides of the synagogue, they were able to conveniently approach the synagogue compound not only from the front but also along two side paths that led to doors on either side of the large front hall. The path to the north is today no longer discernable, and the high wall surrounding the synagogue property offers no hint that there used to be a passage here. To the south, an axis remains although it has been altered and built on. Behind the large front room (now a sales space lined with fish tanks) is the azara, an anteroom appearing in all Kerala synagogues. Kadavumbagam’s azara is cluttered today with the wares of the Cochin Blossoms business, but it once served a variety of purposes. This space gets its name from the ancient Temple in Jerusalem, but whereas the azara in the Temple was a large exterior courtyard where animal sacrifices took place, in Kerala’s synagogues the azara is a fully enclosed anteroom. It was used variously as an arrival space, place for the ritual washing of the hands, waiting area, acoustical and visual buffer zone, seating place for non-members, and spot for storing ritual furniture and objects. The windowed azara leads to the large double height sanctuary with its central tebah, now missing except for its base. The prayer space, with ten windows said to recall the number of commandments, does retain its gilded and painted hand-carved teak heckal, decorated and painted ceiling with a grid pattern of lotus flowers (an Indian motif), and gallery. In Kerala synagogue fashion, the painted and decorated gallery features the second tebah placed on the center of this shallow overlook. Continuing in local synagogue tradition, behind the gallery and second tebah is the women’s seating area. Dividing the two spaces is a mechitza, or partition wall. The rear wall of the women’s seating area has doors that provided an easy way into this space when it was used. From here, the upstairs areas that once functioned as a Jewish school could also be accessed. During the 1950s and 60s, many members of the Kadavumbagam Synagogue immigrated to Israel, and membership in the congregation dwindled. Until the early 1970s, the Kadavumbagam Synagogue was still substantially intact. By 1972, the synagogue had closed and within two years the Torah scrolls were transported to Moshav Nevatim in Israel, an agricultural community which now hosts the Cochin Jewish Heritage Center. In 1975, a storm struck Ernakulam and caused serious water damage to the synagogue. The roof and walls were compromised and foundation damage required the entire structure to be hydraulically lifted. Making matters worse, in 1977 thieves broke into the synagogue and stole some contents. In 1979, the remaining community passed the guardianship of the building to one of its long-standing members, Elias Josephai. For the next six years, the Kadavumbagam Synagogue lay vacant, until in 1985 Josephai established a plant and fish store in the building. The former synagogue has since been known as “Cochin Blossoms”. CURRENT STATUSThe Cochin Blossoms shop owner, Mr. Elias “Babu” Josephai has over the past years renovated portions of the Kadavumbagam Synagogue, and the work is ongoing. Used as his place of business for a quarter of a century, he is not yet in a position to transfer control of the building to the Jewish community or to the government, and for this reason there cannot be any serious effort to fully restore the synagogue and make it available as a dedicated cultural site. Visitors are, however, welcomed to tour the former synagogue and its grounds when Cochin Blossoms is open during business hours, which includes Saturdays. A heritage plaque identifying the structure as a former synagogue was installed by the “The Friends of Kerala Synagogues” to the right of the front entry in 2009. CITED SOURCESSassoon, David. Ohel David. Oxford: Oxford University Press, 1932. Waronker, Jay. Interviews of Elias “Babu” Josephai, Ernakulam India, 2007 and 2009.